Betty Kuntiwa Pumani is recognised for her bold paintings of Antara. Her late mother Kunmanara (Miliatjari) Pumani taught Betty and her older sister, Ngupulya Pumani to paint this site, which is of utmost importance to her family and part of her mother’s country. Antara is connected to the maku (witchetty grub). 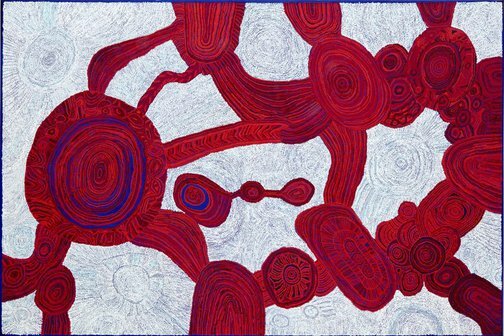 This stunning work won the 2017 Wynne Prize and offers a vibrant image of country, painted in striking colour. Betty’s signature reds evoke the rocky desert country of Antara, while simultaneously suggesting blood or viscera, and an unmistakable energy. The contrasting areas of white and its subtle tonal shifts are a quiet and patient counterpoint to these pulsating reds.